Holly - NEEDS A HOME! Holly is a stunning German Shepherd cross who, although she gets on with other dogs, would be most suited to an environment where she was the only dog living there. She is a playful girl and gets on with children and adults alike. She is also good with cats and has lived alongside them before without causing any problems. She will be of medium to large size and has a great character. She is also very clever and would be well suited to a fairly active lifestyle. Maxima has only been at the pound for a short time and still hasn't come to understand where she is yet. She is a lovely Dobermann cross with a very laid back personality. She is roughly medium in size, NOT large as people first assume, and she is gentle and easy going. She ws surrendered to the pound when no one could look after her after her owner died. Ice is a stunning Husky cross that has been left completely and utterly confused as to what is going on. Sadly, his owner died and he was surrendered to the pound as no one could take care of him. We were originally under the impression that Ice was a guarded, wary boy, but it has been made clear to us these past few days that we simply just did not understand his actions. He was mourning the loss of his recently deceased owner, and the only home he had ever known. Ice is not a guard dog as we first thought, but an affectionate, loving, and beautiful Husky cross. Ice needs integrating back into a home as this is clearly where he feels safe. Please consider our beautiful boy, as he has unfortunately had no interest since he came to us and his time is rapidly running out. Sky - NEEDS A HOME! Sky is a very nervous male Pointer cross. He is small in size and has been in the pound since he was just a baby. He is now approximately 18 months old and is yet to learn what love is. This poor boy struggles to trust but with restricted contact time to visit the pound he isn't receiving the attention he needs. He needs a home with someone patient, understanding and gentle. We have had many Pointers come to us in this state but once they find the right person to give them the hugs and kisses they need, they make unbelievable companions. Sky previously suffered with mange but has been on medication for this and his skin is now recovering well. Bruto - NEEDS A HOME! Bruto is a small sized Labrador cross with a funny personality. He is much smaller than the average Labrador but he won't let you forget about him! He is brimming with love to give and very playful. He adores human attention and gets on well with other dogs. The dominant Labrador in him means he carries a lot of the similar traits, so if you're usually a Lab lover, perhaps Bruto is the boy for you! Flake - NEEDS A HOME! Flake is a beautiful Labrador cross who has had very little luck when it comes to finding a home. He has been in the pound for months now and no one has come forward to give him that second chance he so desperately deserves. He is a gorgeous dog, medium in size and about one year old. He needs someone to show him what love is and restore his faith in humans. Flake loves human company and is a big fan of children too. Our main concern with Flake is his weight. As you can see in the photo, his ribs are showing. This is from stress and lack of resources, so his new adopters need to be prepared to fatten him up and restore his good health. 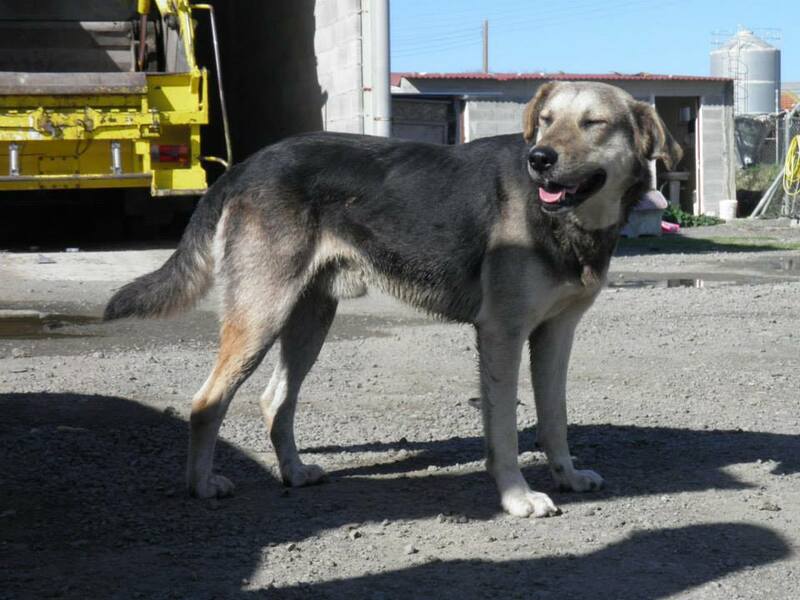 Shadow is a male Labrador cross, roughly between 2-3 years. He is handsome but nervous and needs someone with love and understanding to help him learn to trust. He's clearly been through some tough times whilst being a stray and his confidence has suffered as a result but he will make a simply amazing companion once he is shown the affection he deserves. Mare is a female Pointer cross and has an incredibly loving disposition. She is beautiful in appearance and has a huge heart. She is one of our oldest dogs in the pound, but still just three years old and with so many years of love and happiness to give to a family. Mare adores children and is playful but gentle. Davide is a small boy and a fairly new arrival in the pound, but that doesn't give him any advantage in this situation. He is most likely a Mini-Pinscher cross and has beautiful markings of black and tan. He is a young dog and is yet to learn what it feels like to be safe although he is very happy to give you his love once he gets to know you. He is nervous at first but he does slowly come round. Davide is definitely going to make a lovely little companion and his personality will blossom once he finds his ideal home. Aliza is around two years old and has been in the pound for a few months now. She is a stunning Whippet cross and is medium in size. Aliza would make a brilliant family dog as she adores human company and enjoys cuddles. She is also good with other dogs and generally a very easy going girl. Antares is a very gentle male and is around one year old. He has the most beautiful colouring to him and is a Pointer/Labrador crossbreed. Despite the busy atmosphere in the pound, Antares is exceptionally calm and gentle, seemingly never phased by anything. Not only is he brilliant with humans but he also enjoys the company of other dogs and gets on very well with them. Xander is a real sweetheart. He is just 5 months old and is a Boxer cross puppy with a very loveable personality. He is funny, playful, and very loving. As he is a black dog we have found that he is proving difficult to rehome, a common problem with dogs of his colouring. Xander will be of medium size when he is fully grown and he is also great with other dogs. AJ is a gorgeous Beagle cross, medium in size and very friendly in nature. He is approximately 2 years old and like all Beagles he adores both human company, and that of other dogs. He is easy going, gentle and loving. AJ was found as a stray around the hunting season, which unfortunately is the same story for many of our hunting dogs. Sadly, hunting is a big thing over in Cyprus, and if the dogs prove to be inadequate for the sport, they are dumped without a second thought. AJ would make a fantastic family companion and is looking for a family to give him the love he so desperately deserves. Spartan is a 2 year old Pointer/Labrador cross but is only small in size. He has a gorgeous appearance and a personality to match. Spartan absolutely adores human affection and craves companionship with people. He is fantastic with children and would therefore make a wonderful addition to the busy household. He is also very good with other dogs, making him the ideal family friend. Don is a small sized Dachshund/Terrier cross with black and tan/beige markings. He has a lovely character and is approximately two years old. Despite his abandonment, Don is wonderful with people and incredibly loving. Not only does he get on well with humans but he also likes the company of other dogs and would make a great family companion. Aqua is such a sweet girl. She is a small terrier crossbreed and although she can be a little timid at first she absolutely adores human attention once she gets to know you. Aqua recently escaped from the pound and became very stressed and confused by the whole experience. She was roaming the streets for a week at least before she was found again she the poor girl needs to know what it feels like to settle down in a loving, caring environment. Aqua is a friendly, gentle girl with a craving for love and cuddles. She just needs someone to give her them now. Daniel is a pound sweetheart. He is a hidden gem and would make an incredible companion. He is a Pointer cross and is roughly one year old. Although when Daniel was found as a stray he was nervous and frightened of the environment, he has now come out of his shell to show that he is an exceptionally loving, gentle, and friendly hound. He is medium in size and adores the company of humans. He is also great with children and other dogs, and would make a brilliant family pet. Biscuit is a short haired terrier, small in size, but with a big personality. She is the Queen of the pound and although she gets on well with other dogs, everyone knows that Biscuit is the lady in charge! She is around 3 years old and very, very friendly. She is calm and after a 10 month stay in the pound she is at exceptionally high risk unless we find her a home quickly. As our longest pound resident, along with Spot and Lucas, she thinks that this I the normal life for a dog. To see Biscuit rehomed would be incredibly rewarding as we know she would provide a family with so much joy. She adores children and would therefore make a great family dog. Lucas has been in the pound for around 10 months. In fact, at just one year old he has spent more of his lifetime behind the chain-link fences than he has out in the open world. He was found as a stray and ended up in the SPDC pound in Nicosia, Cyprus after being found by a volunteer. He is a Labrador cross and is small to medium in size with a very gentle and loving character. Lucas is another boy that would make a brilliant family dog, as he loves humans and other dogs.